Killer cell immunoglobulin-like receptors (KIRs) are transmembrane glycoproteins expressed by tural killer cells and subsets of T cells. The KIR genes are polymorphic and highly homologous and they are found in a cluster on chromosome 19q13.4 within the 1 Mb leukocyte receptor complex (LRC). The gene content of the KIR gene cluster varies among haplotypes, although several 'framework' genes are found in all haplotypes (KIR3DL3, KIR3DP1, KIR3DL4, KIR3DL2). 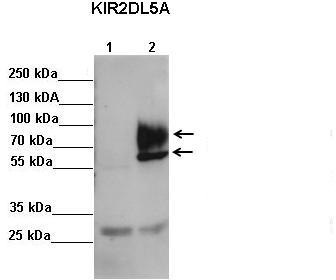 The KIR proteins are classified by the number of extracellular immunoglobulin domains (2D or 3D) and by whether they have a long (L) or short (S) cytoplasmic domain. KIR proteins with the long cytoplasmic domain transduce inhibitory sigls upon ligand binding via an immune tyrosine-based inhibitory motif (ITIM), while KIR proteins with the short cytoplasmic domain lack the ITIM motif and instead associate with the TYRO protein tyrosine kise binding protein to transduce activating sigls. The ligands for several KIR proteins are subsets of HLA class I molecules; thus, KIR proteins are thought to play an important role in regulation of the immune response. 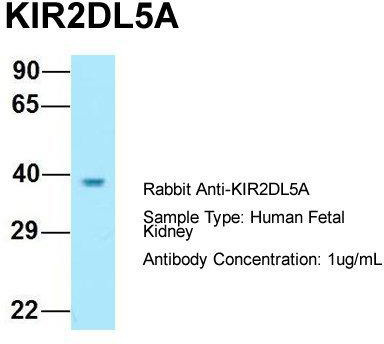 Western Blot analysis of KIR2DL5A expression in transfected 293T cell line (H00057292-T01) by KIR2DL5A MaxPab polyclonal antibody.Lane 1: KIR2DL5A transfected lysate(41.25 KDa).Lane 2: Non-transfected lysate.